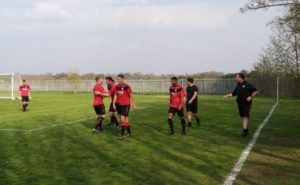 On a brilliant Spring day Hounslow Wanderer’s and Wraysbury Village served up a super cup tie. Chris Randall, James Cartwright, Ollie Pitt, Carl Williams, Joe Atherden, Dan Scarlett, John Mallard ©, Mack Bermingham, Jack Mernagh, Levi Smith and Garret Pikulak. The subs bench was Sean Hill, Perrie Dhesi, Mitch Formaisano, Harry Longman and Alfie Fairhall. It was a cagey opening to the game with neither side looking to make an early mistake. Both sides looking comfortable with the ball and looking to create something against two deep laying defenses. Hardly surprising considering the high number of goals scored in this fixture throughout the season. It would be Hounslow who had the first chance of note, when a break down the Wraysbury right, resulted in a 20 yard thunderbolt of a shot, was tipped onto the bar by a flying Randall in the stags goal. This was a top save as the ball was swerving and dipping into the top corner. 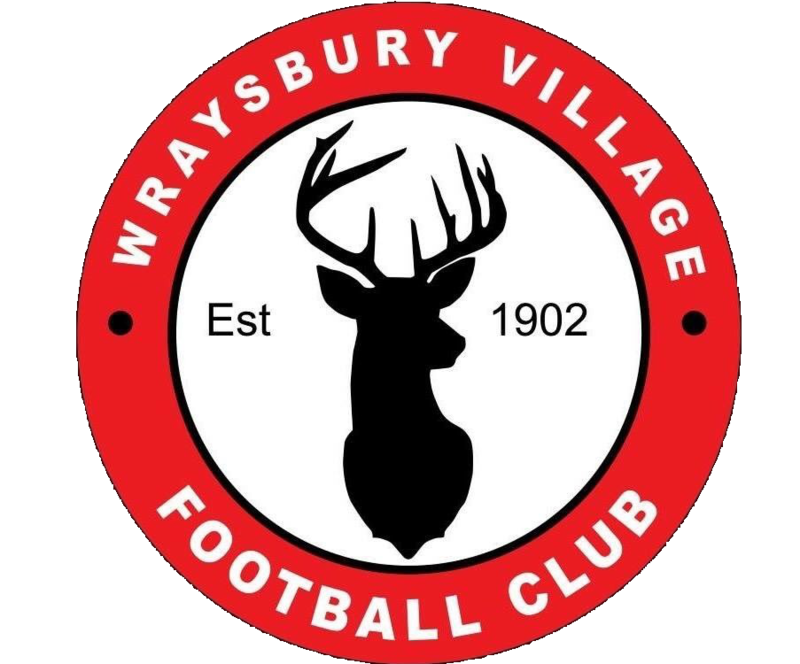 Wraysbury however, took the lead after 40 minutes with our first real attack. Cartwright, carrying the ball from left back, fired a pass to the feet of Pikulak, who turned the ball round the corner to Jack Mernagh, he kept it in play to the byline and fired a low cross across the face of goal, which was controlled by Levi Smith, who then fired into the bottom corner. 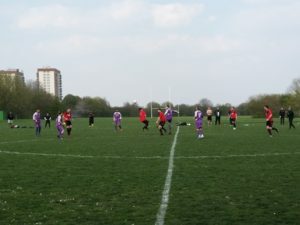 The first half ended Hounslow 0 – 1 Wraysbury. At Half time, Wraysbury made 2 subs with Mitch Formaisano replacing Joe Atherden and Sean Hill coming on for Jack Mernagh. The changes paid instant dividends with Formaisano being brought down about 30 yards from goal. Mack Bermingham whipped a beauty of a free kick into box and the Gazelle like Sean Hill leapt to volley in the second. What a start to the half! Hounslow were shell shocked and Wraysbury quickly pounced, Bermingham again involved, found himself in acres of space, before switching the pall to the right wing, where Smith controlled the high ball expertly before beating his man and drilling a cross in. Pikulak had made the run to the far post and fired his header back across goal for the 3rd. This was superb team goal. The Stags could now smell blood in the water and quickly had a 4th. Pikulak intercepted a goal kick and laid the ball into skipper John Mallard, he turned his man with an outrageous flick, before beating a second, with no pass on he carried on goal and beat a 3rd and 4th man. With only one man to go, he popped the ball through his legs before repeating the nutmeg on the keeper, scoring a truly brilliant solo goal. This sent the Wraysbury team, bench and travelling support into wild celebrations! With Wraysbury leading by 4 goals to nil into the last 10 minutes, a poor defensive free kick led to a Hounslow corner who threw caution to the wind and sent up the keeper, he then rose highest to win the header and nodded past Randall to get a goal back for the hosts. 4 – 1. 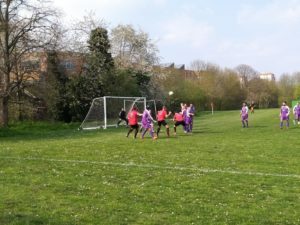 The scoring wasn’t finished as Hounslow gave themselves a glimmer of hope as the striker beat the offside trap before rounding Randall and slotting in for a 2nd Hounslow goal. The final score at Heston Community Centre Hounslow Wanderer’s 2 – 4 Wraysbury Village. The Frost web man of the match, Ollie Pitt.